The old photos of SLO County's Veterans Services Office (VSO) are grim. They show walls with large splotches of crumbling plaster and cardboard boxes carelessly stacked against counters. 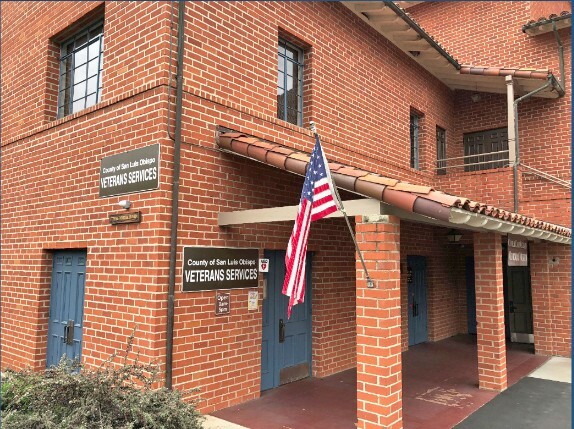 MARCHING FORWARD SLO County's Veterans Services Office has been working to improve itself inside and out over the last two years. "The condition of the office was very poor," Veterans Services Officer Christopher Lopez told members of the SLO County Board of Supervisors June 11. "The carpet was torn and stained in several areas. There was only one working scanner, and our computers were outdated and working very slowly." That was two years ago, and how the office looked was the least of the department's problems. Lopez, hired in 2016, took over a VSO whose reputation had been damaged after its last full-time administrator left under a cloud of questions about the department's money-handling practices. Since then, the office has transformed, both physically and operationally, improving its ability to get more SLO County veterans and their families the services and support they are entitled to. "Our office now presents itself as a well-organized and efficient department," Lopez told the board during a presentation at its annual budget hearings. Lopez, an Army veteran, was hired in February 2016 following the short tenure of interim Veterans Services Officer Paul Porter. The last full-time service officer, Dana Cummings, voluntarily resigned from the position in 2015, shortly after an audit by SLO County Auditor Controller Jim Erb raised questions about the department's handling of cash donations. A lawsuit Cummings later filed against the county stated that his resignation was the result of ongoing personality conflicts with former SLO County Administrative Officer Dan Buckshi. That lawsuit was dismissed with prejudice in 2017. Since Lopez took over, he said he and his staff worked to improve the look and operations of the office. In addition to addressing the poor state of the office itself, Lopez reorganized the department's hierarchy, adding two supervisor positions to improve efficiency, staff morale, and productivity. The total number of claims filed by the office on behalf of local veterans or their families with the U.S. Department of Veterans Affairs increased from a low of 2,485 in fiscal year 2015-16 to an all-time high of 5,108 in the current fiscal year, according to data from the VSO. The same data showed that the amount of time those vets and their families had to wait between filing claims and getting their benefits also improved, dropping from an average of more than a year in FY 2013-14 to just four months in FY 2017-18. Lopez also said that the VSO filled a backlog of claims in FY 2016-17, resulting in a total of $8.4 million in monetary benefits to veterans and their families as well as another $6.2 million in the current fiscal year. Lopez credited the improvement to his office staff, which he described as "relentlessly working toward continuous improvement." At the budget hearing, SLO County 5th District Supervisor Debbie Arnold noted the department's changes. "The stats are showing improvement," she said. Lopez's presentation included a video message to the board from local veteran William Cattaneo, who said he'd seen the difference in service levels at the office firsthand. "I feel good coming here," Cattaneo said. "The caring people help you with any difficulties you might have." This year, the VSO also hosted "The Wall that Heals," a mobile replica of the Vietnam War memorial. The wall, which was installed at Madonna Inn's meadow in April, drew more than 12,000 visitors, according to Lopez. "Our office was truly honored to host such a powerful event," he said. The department plans to continue improving and expanding its services. Recently it started working with veterans in the SLO County Jail, and will likely return to the board in the future to request an additional staff member to help expand other programs. The improvements that Lopez said have taken place at the office not only rehabilitated the department's reputation, but directly benefited those it serves.